The University of Ulster has appointed Dr EilÃ­s McCaughan as Ireland’s first Professor in Cancer Care. Her appointment marks the institution of the first university Chair in Cancer Care in Ireland. Professor McCaughan is a clinical academic who is widely respected for her research into the experiences of people affected by cancer. 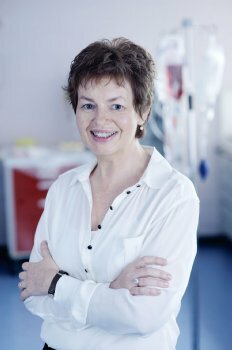 She has an international reputation as a leader in cancer care research and leads and collaborates on a number of multi-centre research projects. These include areas such as men and cancer, support for women undergoing breast reconstruction for breast cancer and helping parents diagnosed with cancer cope with children and family issues. She has held a range of appointments in both clinical and academic settings and is actively involved in cancer care developments at local and national levels. Professor McCaughan has published widely on cancer care and is a member of the editorial boards of the European Journal of Cancer Nursing and the Journal of Clinical Nursing. Working as a Macmillan Cancer Lecturer/Practitioner between Altnagelvin Area Hospital and the University of Ulster, Professor McCaughan was instrumental in setting up the nurse-led chemotherapy service at Altnagelvin. She was appointed as a Lecturer in Nursing at Ulster in 1998 and promoted to Reader in Cancer Care in 2008. Professor McCaughan leads a team of experienced researchers at the Institute of Nursing Research at the Coleraine campus and in the wide-ranging projects in which she is involved also works alongside patients, health care professionals, academics and cancer charities. Professor McCaughan said: “As cancer screening and treatments become more effective, cancer can be diagnosed earlier and patients live longer post diagnosis. Consequently, cancer is increasingly being seen as a chronic disease. “This means there are rising numbers of people who are surviving cancer, and living relatively well. Some of them have symptoms and long-term side-effects of treatments which we are only starting to understand now. “Other challenges that can arise for individuals may involve physical, social, psychological and financial factors. Professor McCaughan leads a programme of work whose overarching aim is to meet the needs of men living with cancer. Studies conducted by the team have focused on exploring and assessing longitudinally the impact of prostate and colorectal cancer and treatments on men, and their reactions and responses to them.